Deconvolution immunofluorescence microscopy of PfNT1 in P. falciparum-infected red blood cells. Parasites were examined by deconvolution microscopy using illumination at 546 nm to visualize PfNT1 (panels A–D), PfHT1 (panel E), and P. falciparum protein phosphatase 2C (panel F) conjugated to the FITC-conjugated anti-rabbit secondary antibody or at 488 nm to visualize Band 3 complexed with the Texas Red-conjugated anti-mouse secondary antibody (all panels). Panel A depicts a ring stage parasite, panel B shows two trophozoites, and schizonts are exhibited in panels C–F. Each panel is accompanied by an inset displaying nuclear staining with Hoechst dye.Rager N, Mamoun CB, Carter NS, Goldberg DE, Ullman B. Localization of the Plasmodium falciparum PfNT1 nucleoside transporter to the parasite plasma membrane. J Biol Chem. 2001 276:41095-9. 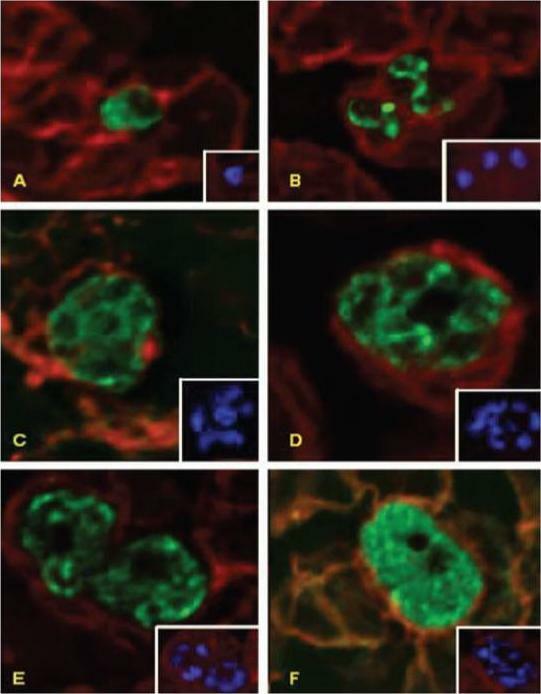 Deconvolution immunofluorescence microscopy of PfNT1 in P. falciparum-infected red blood cells. Parasites were examined by deconvolution microscopy using illumination at 546 nm to visualize PfNT1 (panels A–D), PfHT1 (panel E), and P. falciparum protein phosphatase 2C (panel F) conjugated to the FITC-conjugated anti-rabbit secondary antibody or at 488 nm to visualize Band 3 complexed with the Texas Red-conjugated anti-mouse secondary antibody (all panels). Panel A depicts a ring stage parasite, panel B shows two trophozoites, and schizonts are exhibited in panels C–F. Each panel is accompanied by an inset displaying nuclear staining with Hoechst dye.PfNT1 and PfHT1 are localized to the parasite plasma membrane. Antibodies specific for the cytosolic P. falciparum protein phosphatase 2C enzyme produce a diffuse staining pattern indicative of its cytoplasmic milieu.Rager N, Mamoun CB, Carter NS, Goldberg DE, Ullman B. Localization of the Plasmodium falciparum PfNT1 nucleoside transporter to the parasite plasma membrane. J Biol Chem. 2001 276:41095-9.